NETWORK FINALS: The only change in final numbers was a 0.1 dip for the AMERICA’S GOT TALENT rerun. CABLE HIGHLIGHTS: Discovery’s ALASKAN BUSH PEOPLE led a low night of Friday cable, down 0.05 to 0.46, with lead-out HOMESTEAD RESCUE down a tick to 0.29. Adult Swim’s DECKER: UNCLASSIFIED ticked up to 0.45, and CHECK IT OUT gained 0.04 to 0.40. On Lifetime, BRING IT rose 0.03 to 0.44, and THE RAP GAME fell 0.05 to 0.39. Disney Channel’s GIRL MEETS WORLD was down 0.03 to 0.42. HBO’s REAL TIME WITH BILL MAHER climbed 0.05 to 0.40. In the pre-Adult Swim hour of 7PM, Cartoon Network’s STEVEN UNIVERSE hit the Top 10, even though it was down 0.02 to 0.32. History’s ANCIENT ALIENS was steady at 0.31. 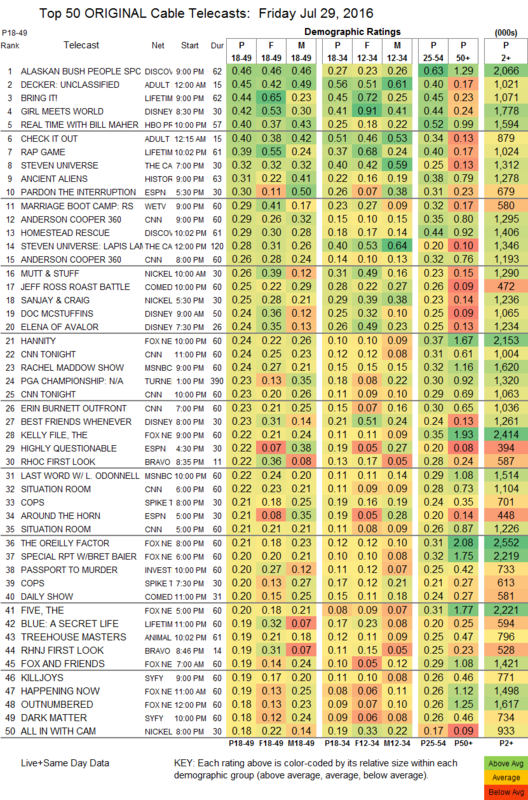 On We, MARRIAGE BOOT CAMP gained 0.06 to 0.29, but MILLION DOLLAR MATCHMAKER was down 0.02 to 0.14. On Comedy Central, the 3rd night of ROAST BATTLE was at 0.25, and a special edition of THE DAILY SHOW was at 0.20. 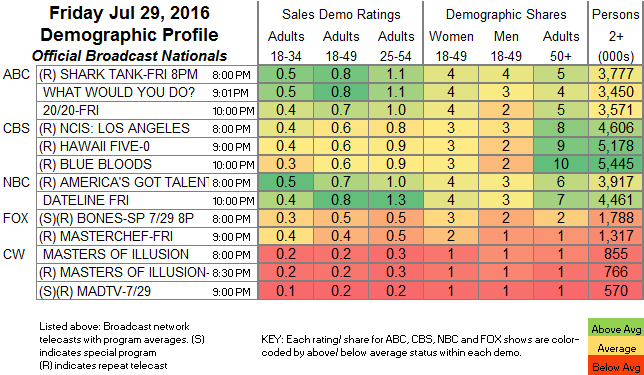 On Syfy, KILLJOYS gained 0.07 to 0.19, and DARK MATTER was up 0.05 to 0.18. OWN’s LOVE THY NEIGHBOR dropped 0.03 to 0.13. Bravo’s REAL HOUSEWIVES OF MELBOURNE fell 0.04 to 0.07. Cinemax’s OUTCAST gained a tick to 0.06, enough to put it back on the chart.